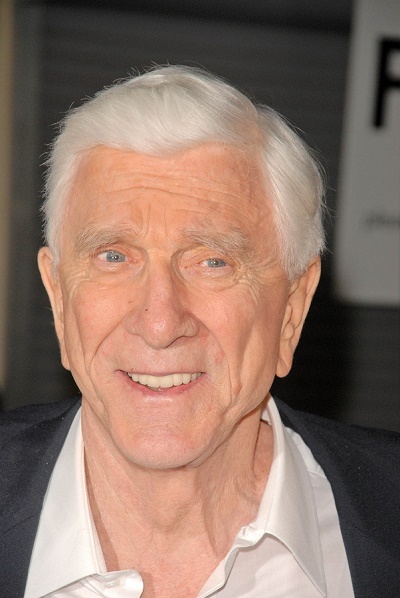 Leslie Nielsen was a Canadian, and later also an American, actor, comedian, and producer. Leslie was the son of Mabel Elizabeth (Davies) and Ingvard Eversen Nielsen. His father was Danish. His mother was of Welsh descent. His brother, Erik Nielsen (Erik Hersholt Nielsen), was a Canadian politician, who was Deputy Prime Minister of Canada, from 1984 to 1986, among other duties. Leslie’s paternal grandmother was Clara/Claire Petersen (the daughter of Carl Magnus Petersen and Frederikke Jacobsen). Clara was the mother of Leslie’s uncle, Jean Hersholt (Jean Pierre Hersholt), a Danish actor. Carl was the son of Carl Magnus Petersen and Eva Marie Conradsen Frisch. Frederikke was the daughter of Jacob Jacobsen and Adelina Salomonsen.